The same rain that forced AroarA off the Main Stage early moved Baby Eagle's (Steve Lambke of Constantines) crowd under the tiny tent of the Side Stage for an "intimate and interactive" set that almost felt like a secret, seeing as it was quiet and hidden away from the rest of the festival and half the audience was on stage with the band. With Ian Kehoe (Marine Dreams) propelling the songs meditatively along on drums, Lambke tried out new material like "Day Of Bad Grace," "Memory Forever" and "Silence Love" while also playing a number of tunes off 2012's Baby Eagle and the Proud Mothers album Bone Soldiers ("Broken Bones," "Brave Women" and "Strange Bodies"). Lambke's a quiet singer, but with his newer songs, he seemed to be traversing the borderline between singing and whispering, which suited the intimacy of the set but made him a little hard to hear, even from metres away. 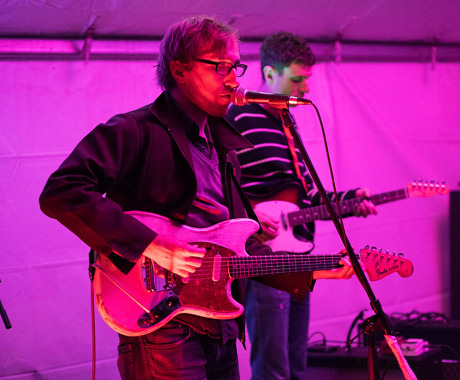 Shotgun Jimmie, heckling from the audience, provided some comic relief with "hashtag, encore" and fellow Con Will Kidman — who played a rare Toronto set earlier in the evening — sat in on guitar for the last few tunes. Baby Eagle and the Proud Mothers Perform "Peace on Earth"